Do you feel your mood sulk most times you enter your office space?. The dull lights, the bland walls and the general atmosphere of “I didn’t want to come into work today” always gets to you. It’s high time you considered a corporate office makeover to make your office appealing and make you or your employees feel energized to work. There’s always positive correlation between office design and productivity so you’ll want to improve your office layout, add some color and make the place interesting. Hoping that your employees will once again find their moxie. With this resolve, you pull open your laptop and start googling cheap office design ideas to make cool office decoration and you come up with some interesting stuff. Unfortunately, most of the office improvement ideas that you’ve read about are simply too expensive and out of your budget if you’re to execute them. To remodel your office space, it usually costs around $150 to $220 per square feet and this translates to thousands of dollars if you’re having 100+ square feet office space. Since you don’t have those kinds of funds at the moment, you decide to postpone the makeover idea for another time. Can you relate to this illustration? Well tough, it’s understandable that expensive makeovers are hard to pull off, but did you ever think that business office makeovers don’t really have to be expensive? If you’re wondering why, then there’s a good reason for that. So, if you’re stuck because of the high prices of office makeovers then consider why you don’t need to go all expensive on them. Your first thought was probably, how? Well, most office makeovers start from the office itself. You don’t need to buy things from somewhere for a makeover since the materials found in the office itself are often used to spark up creativity. Remember, a makeover is something that makes the ordinary look unique. For example, what do you think are the uses of paper? We know the traditional use, i.e. to write information, draw etc., but can it be used for something else? Like, to make a dome for the lamp? If you’ve never thought on this angle, then now would be a good time. The more you think about different ways you can use ordinary objects, the more creativity it shows. So, why is this important? Because when people walk in, they realize that they are part of an office that thrives on creativity and cherishes critical thinking. Valued qualities in this day and age. Who says you need professionals to get a makeover done? You have employees who probably never knew they could do something creative. Yet, each time they open their laptop, they have a unique wallpaper of their interest. This shows that they appreciate a good work of art and already have a sense of what is appealing. Help them tap into their creativity. Every individual is creative in his or her own way, the point being made here is that they just don’t know it. So, what can they do? A makeover doesn’t have to be all fancy. It can even involve a revamp of an employee’s cubicle. Each one can do something that is unique. That would then mean that in an office of 50 cubicle, each one has something unique to offer. As a suggestion, something as simple as using an empty lotion tube to store pens is a creative step up. This point although obvious, is worth mentioning. Why? Because we aren’t saying that you will spend nothing on an office makeover. Being innovative and using what you have in the office will definitely reduce the amount of money you spend. By this method, you can use the money you’ve saved wisely. How about designer architecture? It’s always good to have a weird looking shelf on the walls. Somehow it always keeps the viewers’ attention and adds to the whole creative feel of the place. Being resourceful makes the factor of experiencing a loss at a minimum. Every piece of furniture you already have in the office space comes at a cost. A makeover would mean, letting go of old furniture and replacing it with new ones. Many times, when old furniture is let go or sold, we never get a fair value in return. However, being resourceful is advantageous because the best use is made of that furniture. As an example, converting an old door into a table. Fair value received and the best use of furniture made. As opposed to an elaborate show of highly priced paintings, a great alternative is faux plants. Faux plants have a soothing effect on its viewers and instills in them peace. However, buying real plants means maintenance and that means expenses. The plants we’re talking about are faux plants or artificial flowers/ plants. Why are they better? Well, for a start, you hardly have to spend money on maintenance. A little dusting is all that they need. The variety in the type of plants, the sizes, and shapes that they come in are very impressive. You can buy exotic plants and have absolutely no worry about them rotting. They don’t need specific lightings and are always pleasing to look at. More importantly, they give the office a very classy feel. 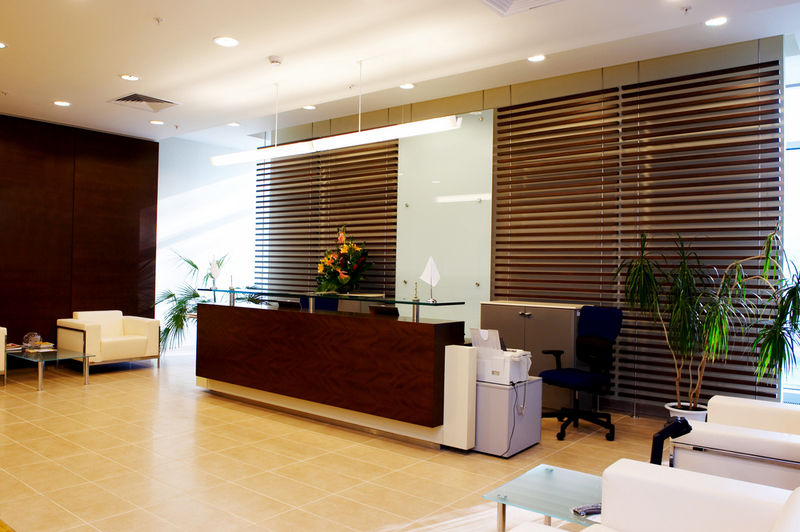 The above suggestions show that expensive makeovers for offices aren’t really necessary. Using what you have and being creative, apart from adding to the improvement in productivity, also have another benefit. When you have spent a lot of money on an office makeover, the scope to change the setting is very limited. This is as opposed to using your creativity on a makeover. This option gives you the leverage to revamp the office space time and time again. Always keeping things interesting and new. Making the office space unique is important because firstly, it defines who you are. Second, it benefits the organization as a whole and third, coming to office, suddenly isn’t a boring feeling. So, don’t get stuck on buying expensive accessories for your office and obsess on giving it a posh feel. You can do all these and more by just getting creative and spending the bare minimum.